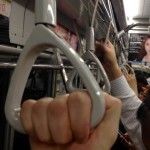 It is critical to understand the prime inner-carriage riding positions when faced with one of Tokyo’s infamous packed trains. For new players, the door-entrance-leaning-position is often easy to attain, offers good back support, and great location stability – allowing you to maintain your position base while other commuters exit and enter the carriage. It’s important to remain vigilant while occupying the door entrance leaning position as incoming commuters may try to gently push you along upon entering the carriage – hold firm. If you feel like chancing your arm at a coveted seat-position take up the seat-transition-hopeful-position in front of present sitters. Naturally, the side-seats are the crème de la crème of inner-carriage positions being both a seating position and providing side leaning support. However, assuming the side-seat-transition-hopeful-position has the added risk of presenting only two seat transition opportunities instead of three from a central location. Standing directly in the centre between opposing doors, and standing doubled back behind seat-transition-hopefuls should be avoided at all costs. These positions offer very little support, as handrails are distant and limited, and grant no immediate prospect of upgrading your current inner-carriage position. Important: When lining up on the platform before your train arrives, don’t stand on the side of the doors nearest to the platform exit – doing so may result in critical delays from a stream of carriage departees causing you to lose valuable seconds while other commuters waiting on the other side have already slipped past the exiting masses and assumed prime positions. If you’re one of the chosen ones to have assumed a seating position, be careful not to make any sudden movements – any personal possession grab or easily discernible seat shift can be misconstrued as a signal of next stop departure and cause deep distress for seat-transition-hopefuls. We advise consistent steady movements at all times whilst savouring the coveted inner-carriage position. 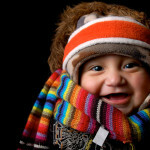 Just think winter in summer, and summer in winter. 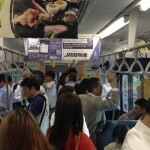 Japanese train air conditioning systems work on a counter-intuitive setting, allowing commuters to revisit their beach attire in the peak of winter, and experience frostbite inducive conditions throughout summer. It is recommended to strip down to a bare minimum before entering a train in winter, and packing some UNIQLO heat-tech attire on your way to that summer BBQ. 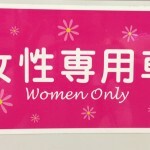 If you’re a man, and there is an abnormal number of women gazing in your direction, it’s probably not because you’re wowing the ladies, but you’re actually standing in a “women only” carriage. If you find yourself in this precarious position, calmly wait for the next stop, exit abruptly, and move along at least two carriages down to avert further embarrassment – the inter-carriage doorway escape will only result in the ‘Forgot It Was Still Before 9:30 a.m.’ walk of shame. Any kind of correspondence with fellow commuters is highly frowned upon. To prevent the urge of striking up a friendly conversation, follow the crowd and immerse yourself in one of the many productive puzzle action games* or get amongst real meaningful interactions on the ever popular Twitter. Alternatively, if you’re one of those people that actually likes reading, try a comic book (manga) – these are often filled with playful violence and discreet eroticism. 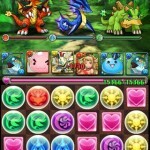 *We recommend the wildly constructive Puzzle Dragon (Pazudora) or Monster Strike (Monsutora) puzzle action games. “The Unintentional Feign” – I thought I was the only person to be sensitive to this! Sometimes when I’m sitting on the train with my wife I feel so bad for anyone standing nearby if she starts putting things in her bag even though it’s not our stop yet – you can see them shuffling and starting to go into hibernation mode in preparation for a seat position. Also, this article should have included a section on priority seats, that horrible grey zone laced with social faux pas. Wherever I sat was a priority seat… some old person would always stand in front of me looking down with a homeless starving dog expression. Of course at the same time making it obvious to the people on each side how uncooperative I was being (not giving up my seat). Just a few metres away were priority seats with high school and university students taking a nap or watching stuff on their phones. Know this experience only too well!